← Motor Neurone Disease Assocation walk. Off to Rushmere last night in an attempt to catch a barbastelle. The nets were in the right place. Barbs came up to the net to investigate, but once again they laughed in our faces and headed off without getting caught. 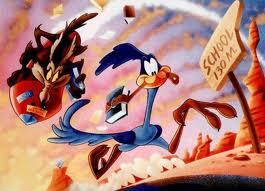 Thought – are they related to the Road Runner any chance? This entry was posted in Join us and tagged barbastelle, Rushmere. Bookmark the permalink.